Home / Exam Technique / Maximise Your Maths Grade Booklet – Download It Here! 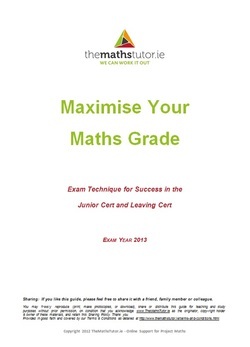 Our comprehensive guide to exam technique for Irish maths students called ‘Maximise Your Maths Grade’ is now available to download! Click on the link at the bottom to get your copy. Feel free to share with friends whether by email, Twitter, Facebook or just by telling them! You could even let your teacher know about the booklet too! If you would like a full colour printed copy, get in touch, we have some copies and we will post them out, but remember it’s first-come first-served! !